Hi everyone! SM Kids Fashion has a good news for mommies (or big sisters like me) out there ! 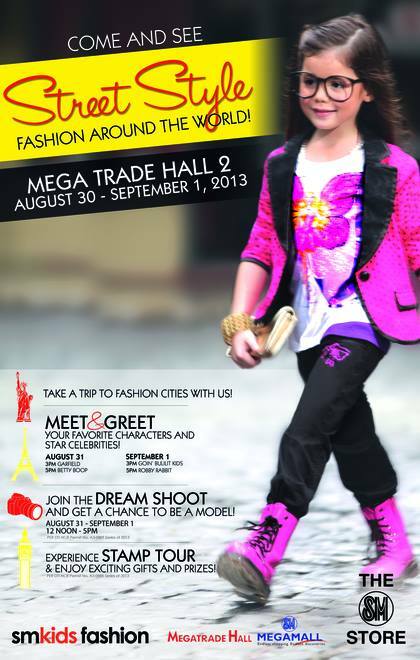 If you have kids at home that are 2-14 years old, series of Fashion related events will be held starting tomorrow until September 1 at Megamall Trade Hall 2. I'm sure your kids will love this event since its their chance to meet some of the toon characters such as Garfield, Betty Boop and Robby Rabbit, as well as some of the kid celebrities from Going Bulilit (I hope Clarence will be there haha)! There will also be a photo shoot wherein they can experience being a model for a day if you present a single receipt purchase from the partner brands. It will definitely be a memorable day for them! So free up your schedule this weekend and hope you will have a fun time attending SM Kids Fashion: Street Style Fashion Around the World event. Have a fun Friday! and comment on my blog if you're done!